“Iwata Asks” will cover The Wonderful 101, developed by PlatinumGames Inc.1 for Wii U, in two parts. For the first part, I have asked Kamiya-san, the game’s director, to sit down for a one-on-one discussion. Thank you for coming today.1. PlatinumGames Inc.: A video game developer founded in 2006. 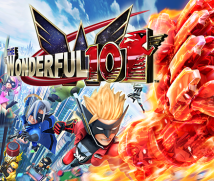 The Wonderful 101 for Wii U is due out on August 23rd in Europe, and the company is currently developing Bayonetta 2 for Wii U. Head office: Osaka. 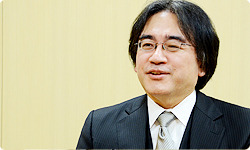 For more information, see the session of “Iwata Asks” dedicated to PlatinumGames. Is that a t-shirt for The Wonderful 101? Yeah. (laughs) I wore it here. I like it! (laughs) Before I ask about The Wonderful 101, I’d like to ask how someone like you, who makes such energetic games, came to be. First, I’d like to ask how you first encountered video games. I don’t clearly remember, but ever since I was very young, I’ve been drawn to the sound of those digital beeps and blips. I remember they were always very familiar to me. Did you play video games mainly at your own house? Or somewhere else? At first, I think I played in the video game corners at department stores and places like that. But when I was an elementary school student, things began to appear that you played by connecting to the television, like TV Vader2, the Epoch Cassette Vision3, Tomy Tutor4 and Intellivision.52. TV Vader: A home video game console released in Japan by Epoch Co. in 1980, featuring a game in which you shoot down extra-terrestrial invaders.3. Epoch Cassette Vision: A cassette-type home video game console released in Japan by Epoch Co. in 1981.4. Tomy Tutor: A 16-bit game PC released in Japan by Tomy Co., Ltd. (now Takara Tomy) in 1982. Known as the Grandstand Tutor in the UK, it was released in Europe in 1983.5. Intellivision: A home video game console released in Europe by Mattel, Inc. in 1982. In Japan, it was released by Bandai Company, Limited (now Namco Bandai Games Inc.) in 1982. Yes. Back then, various companies were putting out their own home consoles. I really wanted a game console for playing at home, but my parents were very strict so they wouldn’t buy one. Everyone was like that then. A lot of people went to someone else’s house to play. An older boy in my neighbourhood had the Epoch Cassette Vision. I really wanted to play it, so I’d go to his house, but he was a bully, so he would be mean to me every time. But you wanted to play anyway? Yes. When faced with the choice of staying home without being bullied or playing Epoch Cassette Vision, the game console was the clear winner. Every time, I’d come home having been punched, but I’d go again the next day. It had that strong of an appeal to you. What was it about the games that had such a pull on you? It’s mysterious. Like I said before, I liked the electronic sounds, so rather than listen to normal music, I felt more comfortable listening to video game music. Of course, I also liked playing the games, but my ears really took to the music. I suppose you were born with that kind of taste. Come to think about it now, yes, I think so. What was the first game console you got? When I was in my first or second year of junior high, I bought a Famicom6 with money I got for New Year’s.6. Famicom: Also known as the Family Computer System, which is the Japanese name for the Nintendo Entertainment System (NES). The Famicom was released in Japan in 1983. After a long time craving one and undergoing hardship, you finally had a means of playing video games in your own home. Yes. But I couldn’t buy it immediately after receiving permission. It was right in the middle of the unprecedented Famicom boom, so no one was selling it. Back then, even if you wanted to buy an Famicom, you couldn’t. And almost none of my friends had one yet. But a department store in my neighbourhood was selling them to the first ten people to arrive when they opened for the New Year, so I got up at four o’clock in the morning and went. When I got there, though, ten people were already lined up! I’m from Matsumoto in Nagano Prefecture7, but even just in Matsumoto, ten people were more determined than I was.7. Matsumoto in Nagano Prefecture: A city on the island of Honshu in Japan, with a population of around 240,000. Exactly. I dragged myself back home. It was New Year’s vacation, so my cousin had come over to play, and he said he had an acquaintance that would sell me a Famicom together with 15 games for the special price of 30,000 yen (Editor’s note: 30,000 yen equates to approximately £200). Yeah. So overnight I became a Famicom millionaire! I was pretty fortunate to have 15 game cartridges back then. I’d say so! No junior high student back then had that many. I know. The first game I bought at the store with my own money was Nuts & Milk8, but I bought that before I bought the console, so I’d just been staring at the cartridge and instruction manual!8. Nuts & Milk: An action game released in Japan by Hudson Soft Company for the Famicom in July 1984. Really? (laughs) What an experience for a junior high boy like that to suddenly get 15 games! Right! Everyone would come to me to lend or borrow games. From that time on, I was absorbed in the Famicom. I think everyone in my generation was like that when they were children. Before, you couldn’t play unless you went to a video game arcade, but now you could play at home all you wanted. It must have been like a dream come true! It was. And the Famicom games were exactly like the arcade games. It was an incredibly desirable object. When I look back at it now, I don’t think I’ve ever been as happy and excited to buy a video game console as I was that time. A number of factors led to that profusion of joy, like how long you had to wait and how much desire had built up. That’s right. I’ve never felt as happy to buy something before or since. That’s what an incredible event it was!